VM_365 Day 346 What about the box? Imports from Colchester. Today’s image for Day 346 shows the wooden box that was used to store some of the Roman pottery excavated at the Roman building near Drapers Mill by Joe Coy in the late 1950’s and 1960’s which featured in yesterday’s VM_365 post for Day 345. The wooden box holding Joe Coy’s Roman pottery dates to the late 1950’s – 1960’s, comtemporary with the time the dig at Drapers Mill was carried out and itself has a story to tell us. Museum stores house thousands of artefacts and when visiting the stores it is often not long before you see an old tobacco tin, wooden matchbox and the like from the 20th century that had been pressed into service as a make-do receptacle for a find. This was a time when Tupperware, cardboard and plastic wrapping were generally less common and before there were stricter museum curation policies (that specify how materials are to be received by the curating museum). So, just as with a visit to the family shed, you can see how, what were familiar items of recent times, were opportunistically utilized for safe storage. Coming across such containers can jog the memory and be a fascinating encounter as sometimes what was ubiquitous, valueless and discardable packaging, say 70 years ago, now has a story to tell. Occasionally this is as insightful as the artefact within. In those times we consumed less, things were less easy to replace, and there was more of an attitude of ‘make-do and mend’; what items came in were often carefully designed and very well-made: here was a chance for the prudent 20th century recycler to find a new use for old packaging. What was to hand was helpfully taken into service, not so much to save cash but more likely because there were limited alternatives. We only have to go back a few decades to the 1960s to be within that time and we can see that Joe Coy’s best pottery finds from the excavations at Drapers Mills from the turn of that decade came to be housed in a robust wooden box convenient for shelving and for transport for when the finds were needed for display or to show the pottery experts. The box is made of thin ply-wood and its measurements and markings are in imperial standards for it pre-dates the switch to decimalization in 1971. Accordingly it measures 11 by 10 inches and has a height of 6¾ʺ. It had been marked in now fading black-ink by stencilling or stamping with the name ‘BETTS’. It was seen recently by Pete Nash who recognized it immediately as coming from the Betts toothpaste tube factory at Colchester. Also marked on one side (more obviously by stencilling and in a different type-face) are the contents, described in light traces as ‘TUBES’ with what is likely to be the quantity given but which cannot now be read clearly. The price is given by means of the same stencil as ‘BETTS’ telling the reader ‘BOX CHARGED 4/-’ in what we call nowadays ‘old money’ namely four schillings (20p in today’s decimal currency). The ply-wood is ⅛ of an inch thick, with metal staples used to bind the sheets together. This makes for a container it is very sturdy but light and doubtless the dimensions relate to the size of the tubes inside and their safe transit and housing. Aptly the box and perhaps what it originally held were imports to Thanet, just as it contains imports from the Roman era in its present use. One of these, a whole globular beaker, as featured in yesterday’s post for Day 346 of the VM_365 project, is a type known from Roman Colchester, one that may have been made there, which would be a striking coincidence. Of course the reuse of former packaging is well-attested through the ages: from Roman wine and oil amphorae seen reused as caskets for burials (with examples known on Thanet and in north-east Kent) to the tea-chests which were an everyday item seen in second use in ‘storage and removal’ through the second half of the 20th century. Doubtless old jam jars will be employed for new home-made jams this summer, some maybe first had jam from Tiptree, near Colchester. The Betts factory which was still operating in the 1960s closed to be redeveloped recently for housing. Joe Coy’s box has become an artefact and its history ties it in time to the important excavations at Drapers Mills that occurred when the box was itself young. What happened to all the thousands of other boxes of this type dispatched from the Betts factory and are there other surviving examples from Thanet? Dr Steven Willis (University of Kent), Photo: Lloyd Bosworth (University of Kent). Thanks to Pete Nash of Colchester. VM_365 Day 309 Artefacts from Anglo Saxon SFB at Woodchurch. Today’s image for Day 309 of the VM_365 project shows a selection of three artefacts which were found in the small segment excavated through the Anglo Saxon Sunken Featured Building from Woodchurch, Thanet that featured in yesterday’s VM_365 post for Day 308. On the left hand side of the image is a sherd of Organic-tempered ware pottery of early to Mid Saxon date (c. 550/600 – 700 AD). On the right hand side at the top of the image is an Iron Knife with a curved ‘hog-back’ blade, with a curved cutting edge that may be the result of repeated sharpening on a round section hone. The small fragment of comb at the bottom of the image has been carved from bone and is from a one-piece double-sided comb. The spacing of the teeth is different on each side, suggesting that it had both a fine and coarse combing side. The image for Day 301 of the VM_365 project is taken from a digitised colour slide that was taken at the site at Dumpton near Broadstairs which was excavated by Joe Coy in the 1960’s. The archive from this excavation has been featured in a series of VM_365 posts, which have been looking at the detail of the finds to try to understand the significance of this unpublished site. Although the archive box for this site is labelled 1965, it appears that the dig began in 1961, when the slide archive indicates that this image was taken. The labelling of individual pottery sherds in the archive also indicates that some were recovered in a dig on the site in 1961. The picture is very important because it proves that one of the major features investigated on the site was a Roman structure, partly built in a distinctive local type of building stone used extensively in the Roman period. Several strands of evidence have led to previous suggestions that a structure from the Roman period was present on the site. The earliest evidence was given in Reverend John Lewis’s History of the Isle of Thanet, where it was noted that Roman coins had been found in the Dumpton area. At the time of writing in 1736, Lewis reported that a Roman wall had relatively recently been observed, but had fallen into the sea following a cliff fall. An excavation carried out by Howard Hurd on the cliff tops when new roads were being laid out on the sea front also recorded ditches and enclosures, which were predominantly of Iron Age date. A dig by the Trust for Thanet Archaeology at site near to Joe Coy’s excavation that re-examined part of Hurd’s published site, recognised that the period of occupation on the site extended well into the Roman period, much later than Hurd had suggested. One significant find in the Trust’s excavation was of a small number of fragments of distinctive Roman roof tile forms, including both Tegula and Imbrex. this evidence all pointed to the previously unrecognised presence of a building on the southern slopes of the dry valley at Dumpton gap. Recent evidence from excavations on major Roman buildings in Thanet have suggested that all were founded on substantial Iron Age settlement sites. It is likely that prosperous Iron Age farming communities in Thanet quite quickly adopted Roman building methods and began to use imported Roman pottery alongside vessels that continued to be made in traditional pre-Roman forms and in local fabrics exhibiting various degrees of influence from the material imported from the Romanised continent. Sadly many of Thanet’s Roman buildings have been so heavily damaged by ploughing and stone robbing that little remains of their structure but the lowest courses of walls or those lining deep recessed parts of the structures like cellars and sunken floor levels. 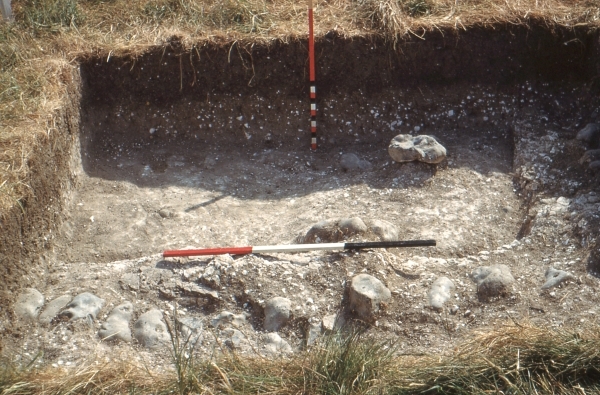 However the presence of structured remnant of walls, built of the distinctive rounded flint cobbles is paralleled on so many sites that their presence in this image, taken with the range of finds that were associated with the excavation site, are strong evidence that another Roman building was present on the southern side of the dry valley that leads to Dumpton Gap. The topographic location of the structure is also similar to the buildings excavated at Stone Road, Broadstairs and the Abbey Farm Villa at Minster. In today’s VM_365 image, the presence of a building is confirmed by the presence of the line of rounded flint cobble wall which is visible running from left to right in the foreground of the image. Although the pictures have not yet been reconciled fully with the plan that was contained in the archive, it appears that the wall is part of the southern side of a rectangular flint lined cellar, which once formed part of the structure of a building. There are striking parallels with the image and the pictures of the surviving structures found further to the north at Stone Road and on the cliff top on the northern side of Viking Bay at Fort House, Broadstairs, which have appeared in previous VM_365 posts. It is likely that further research on the archive and re-examination of the results of the other digs in the area will bring more evidence confirming the importance of this site which spans the Iron Age and earlier part of the Roman period. Today’s image for Day 298 of the VM_365 project shows six sherds of pottery that were present in the box of archive from a 1964 excavation at Dumpton which represent a selection from the assemblage of three common examples of Iron Age pottery which are comparable to pottery found on other sites on Thanet. The sherd of pottery on the left hand side of the image dates from the Early to Middle Iron Age and is an example of a sherd from a large coarseware rusticated jar. Pottery of a similar type and date has been excavated by the Trust from an Iron Age settlement site very close by in the mid 1990’s. The rusticated surface finish on the vessel represented by this sherd was deliberatley applied perhaps to provide an easy grip surface on a large vessel. Alternatively the decoration may have some symbolic meaning which was explored in the VM_365 Day 169 post on some Early to Mid Iron Age rusticated pottery sherds of similar type from Margate. The three sherds in the centre of the image are all sherds from Late Iron Age comb decorated, globular bead rim jars. Comb decoration was a technique that was frequently used in the Late Iron Age period although it had been used earlier in the Iron Age and was explored in detail in the post for Day 223 of the VM_365 project. An example of a reconstructed jar from Margate of a similar type to these sherds was featured on Day 170 of the VM_365 project. The two sherds on the right hand side of the image are also examples from comb decorated jars although these jars would only have been decorated to just below the rim in a similar manner to the jar from Hartsdown, Margate featured on Day 224 of the VM_365 project. The image today, for Day 296 of the VM_365 project, is of three sherds of Roman Mortaria, giving a closer look at the types of pottery that were present in the collection of paper bags storing finds from a site archive from 1964. Mortaria were a distinctive type of Roman kitchen ware made in fine light brown and buff fabrics. Mortaria were made by several Roman pottery manufacturers, many based in the region around the Roman town of Verulamium. The steep sided bowls had flat bases and a broad outcropping rim, incorporating a finely moulded pouring spout. The interior of the bowl was roughened with the addition of sharp grits in the clay fabric. A well established typology and dating series has been developed for these vessels, often based on the makers stamps that were pressed into the rims. The size of the vessels and the moulding of the rim vary between manufactures and can be used to identify individual vessels. 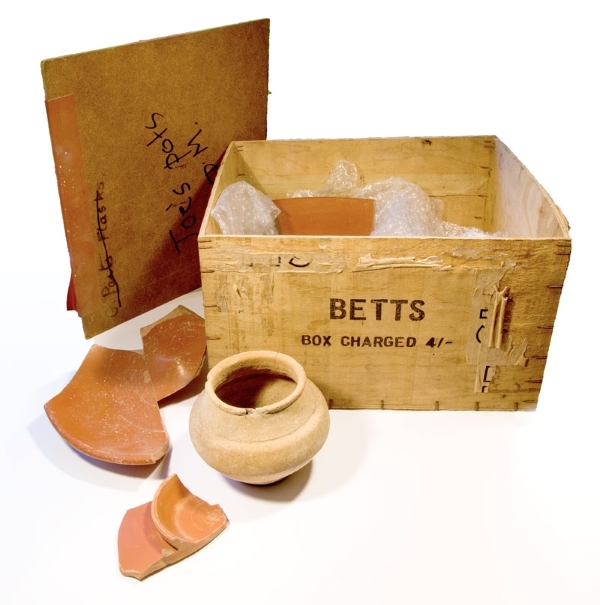 At the Dumpton site the sherds of Mortaria contained in the archive box, and shown in the image here, represent three separate vessels. The presence of Mortaria sherds in the pottery assemblage from the site helps to identify what type of site or settlement the material may have come from and tells us something about its status. Similar Mortaria have been found at both the Abbey Farm Villa at Minster and from a Roman building at Broadstairs, where a well preserved Mortairium was present among many vessels apparently representing the dumped contents of a kitchen. Today’s image for Day 295 of the VM_365 project shows some examples of the paper bags from the archive box , which contained sherds of pottery from the Seacroft Road dig from 1965 that we have been examining in posts for Day 292, Day 293 and Day 294 of the VM_365 project. The paper bags are the next step of understanding what the archive holds and we have been cataloguing the contents and repackaging them into archivally stable polythene bags. 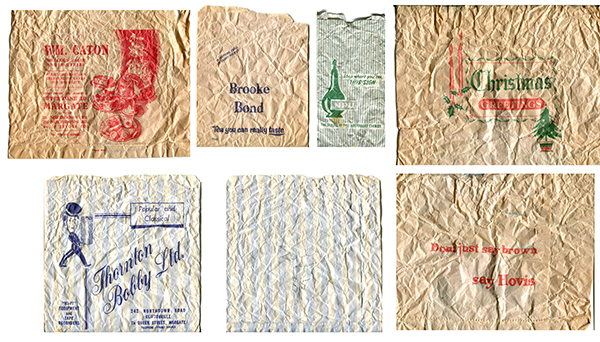 The paper bags date from the 1960’s and possibly 1970’s and are historic artefacts in their own right. Two are from specific Margate local businesses, W. M. Caton, a baker in Upper Dane Road, Margate (top left) and Thorton Bobby Ltd (bottom left and middle) a long established electrical goods business in Northdown Road. The bag from WM Caton, a bakery business which no longer exists, advertises ‘Delicious cakes and Pastries. Bride, Brirthday and Celebration Cakes our speciality’ and apart from their head office and Bakery at Upper Dane Road also advertises three other Margate based outlets of the business, two on Northdown Road and one in Tivoli Road. The bag from Thorton Bobby Ltd advertises that they sell records ‘Popular and Classical’ and ‘Hi-Fi Equipment and Tape Recorders’ in their two shops in Northdown Road and Queen Street, Margate. Thorton Bobby still operates in Margate and branched out into selling electrical goods, not just records and Hi-Fi equipment although it is now known as Euronics Thornton Bobby. The other bags advertise specific brands including Brooke Bond tea ‘A picture card in every packet’ and ‘Tea you can really taste’, NPU Chemists ‘Shop where you see this sign’ and the symbol of the independent Chemist’ and Hovis ‘Christmas Greetings’ and ‘Don’t just say brown… say Hovis’. The Brooke Bond and Hovis bags were probably from local grocery shops where the majority of people would have obtained their groceries before the expansion of supermarket chains and large everything-under-one-roof superstores. More importantly for the purposes of the archaeological archive, a few of the paper bags had information about their contents written on them in pencil. The Thorton Bobby bag (centre bottom) was inscribed ‘Gully B5’ in pencil and this has been transcribed onto the new packaging in case it helps to understand where the material came from. When an archive of this age is examined, it is important to examine all aspects of it, including what might appear to be ephemeral or expedient packaging. A note written in haste on a bag picked up from a local shop may just hold the clue to the significance of the contents or the whole archive. 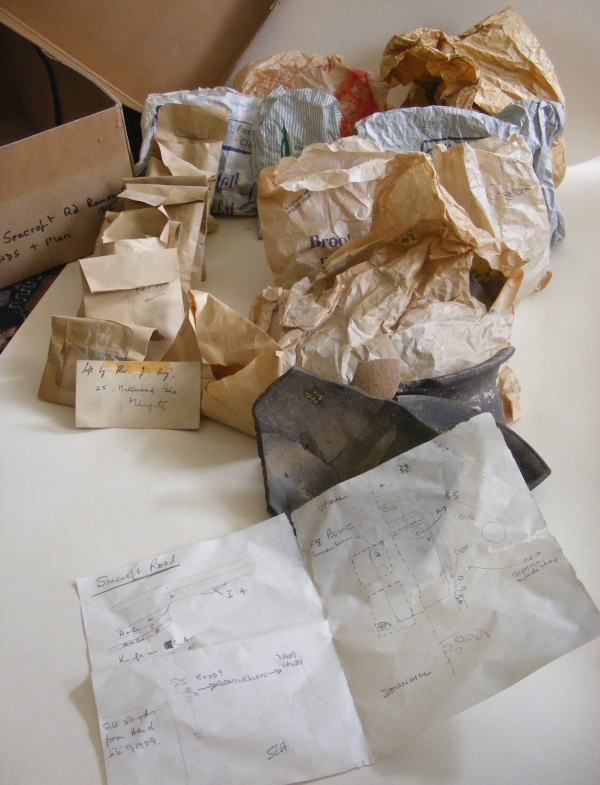 The image for today’s post on Day 294 of the VM_365 project shows the contents of some of the paper bags, stored in an archive box from an excavation carried out by Joe Coy with the Thanet Excavation Group at Dumpton, between Broadstairs and Ramsgate in 1964. 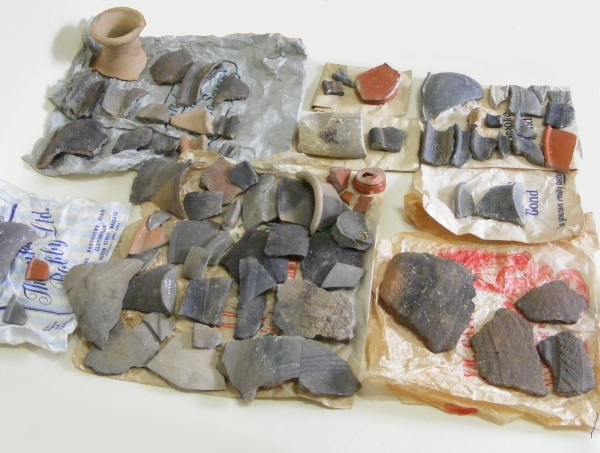 All but two of the bags in the 1964 excavation box contain pottery sherds. The sherds have generally been marked with a site code and feature number, which we now know corresponds with feature numbers on the sketch plan in the box. There seems to be no corresponding finds list, description of the pottery or dating for the items in the archive box, so each pottery sherd may have to be re-examined to understand the date range of the features fully. 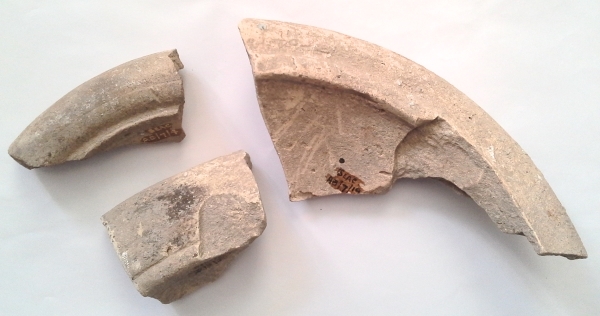 However even a casual examination of the material reveals the span of the dates covered by the sherds, apparently a classic assemblage spanning the Late Iron Age and Early Roman period. Many of the pottery sherds are comparable with typical vessel types from other sites the local area, which have featured in earlier VM_365 posts. The site excavated by Joe Coy and the Thanet Excavation Group in 1964 is very close to a large site excavated at Dumpton Gap by Howard Hurd, one of Thanet’s archaeological pioneers. Although Hurd emphasised the Iron Age aspects of his site, described by him as the remains of ‘a Late Celtic Village’, later excavations suggested that there was a more significant Roman element to the settlement than was previously thought. As we start to understand the 1964 archive, it looks likely that this will make a significant contribution to understanding that Roman settlement phase here. The analysis will continue in subsequent posts. VM_365 Day 293 What’s in the archive box? The Image for Day 293 of the VM_365 project is of the contents of the small cardboard archive box we started to look at in the post for Day 292. Although we have an idea from the label of the general area where the material may come from, a site at Dumpton Down between Broadstairs and Ramsgate, there is no record of what is actually in the box. Our first task is to see what sort of material the archive contains, and what condition it is in. Then we need to know what sort of information it might be able to give us. In fact, even at first examination the box contains some very useful material. At least the box doesn’t contain bags of unwashed pottery or dried up leather. 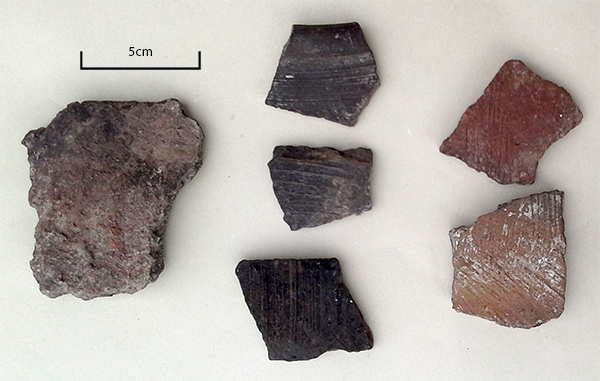 The artefacts, which generally seem to be pottery sherds of small to large size, seems to have been processed well. Among the containers stored in the box amount to eight paper bags from shops, which in themselves amount to something of a historic archive. There are also eight small brown paper envelopes, of a type people would have received cash wages in. Another similar wage packet envelope as a clear window in the front. There is one standard small brown envelope and a quantity of loose pottery sherds, some glued together to reconstruct part profiles. A small card in the box has the address of the excavator, Mr. Joe Coy, from the 1960’s or 70’s written on it. Best of all, there is a small paper sketch plan of an excavation, possibly where the artefacts came from. It’s not a perfect plan but it will help to evaluate what the finds in the bags can tell us. Each bag seems to have a feature code written on it, which may correspond with the plan and most of the sherds are marked with a site and feature code. Although perhaps the containers leave something to be desired in archive stability, polythene mini-grip bags are probably preferable to a paper bag from a butcher’s shop in Margate, they have retained their contents reasonably well in the half century since the excavation was carried out. In our next post for VM_365 Day 294 we will take a look at what is actually in some of the bags and what we might learn from the finds. Today’s image for VM_365 Day 292 is of an unknown quantity, an archive of archaeological finds and records that has not been examined for decades. The long archive box above has a label that identifies it as being from an excavation carried out in 1964 by one of Thanet’s pioneering archaeologists Joe Coy, leader of the Thanet Excavation Group in the late 1960’s and 1970’s. All over Britain there are similar collections of unexamined material that may hold all kinds of useful and informative material. What could we learn if each one of these collections could be opened and assessed? Digs that are decades old may have useful material to help with the interpretation of old sites and more recent excavations. To begin with, the label on the box at least gives the artefacts in it a location, a site near Dumpton Gap, on the east facing downland between Ramsgate and Broadstairs facing the sea to the east. Many excavations have been carried out in the area, over decades and by different groups and excavators. The archaeological data we have for the area is widely distributed, and is in many respects rich and complex, but rather than a blanket of information we have something more like a moth eaten sheet, full of holes and missing pieces because of the tragic effects of time and entropy on the records and archives. After long years of travel and storage this small archive has finally ended up in the Trust’s collection. It has become our responsibility to understand and preserve the material in the archive and pass it on as fully as we can. This post for VM_365 will be the first of series that follows our exploration of what is almost an archaeological excavation in itself. We will begin to unpick the layers of material contained in the box and try to understand the value of each deposit and artefact that we discover.